If there's one thing that bugs me, it's a restaurant that doesn't have its concept figured out -- the menu lacks focus, the servers are out to lunch when you want to be at lunch, etc. So I'm happy to report that M Cafe on Melrose has its concept down to a science that should probably be replicated in health-conscious upscale enclaves across the country. I'm sure it helps that the cafe is owned by the proprietors of the Chaya restaurants, who must be doing something right to have lasted so long in this fickle town. All of M Cafe's food is organic and macrobiotic -- free of white sugar, dairy and eggs. There's no meat, but there is some seafood. As you walk in the door, there's a section with pre-made food if you need to grab and go -- bento boxes with salmon, tofu and seitan, wraps, sandwiches and salads. Otherwise you order from the deli case and the hot foods menu, pay at the counter and sit down and the servers bring your order in just a few minutes. Joe and Mike at Variety recommended the barbecue seitan sandwich ($9.95) and the ahi tuna burger ($11.95), but it was so darn hot that we opted for salads and sushi. I had a beet quinoa salad and a seafood/seaweed/pasta salad and Amy had the millet salad with a few tuna and veggie rolls. Unlike most ultra healthy food, the salads actually had flavor, especially the millet with roasted squash, lots of garlic and garbanzo beans. There were lots of tempting desserts in the display case, including tofu cheesecake, so I tried a green tea chocolate truffle. Barely sweetened, it wasn't exactly Boule quality, but the intense bitterness of the chocolate grew on me and it was just the right size for a small dessert. Skip the kinako soy-dust covered truffle, though. I mean, soy dust -- really. 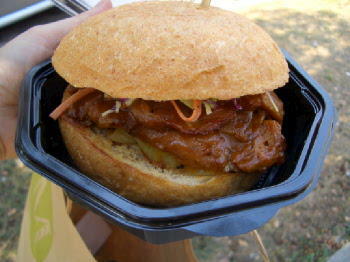 Update: Tried the barbecue seitan (wheat gluten) sandwich -- nice zippy bbq sauce, good sloppy pulled-pork kind of feeling. With a big, soft wheat bun, it's kind of bready, but good for those who need a heartier, yet still healthy meal. And the accompanying kale salad with peanut sauce was a painless way to sneak in those healthy greens. They also have the cutest little takeout containers -- I'm starting a collection! Verdict: A great place for light, healthy eating. Of course, quality like this doesn't come dirt cheap, but it's within range of other places in the neighborhood. The only drawback is that if the few tables inside fill up, the broiling outdoor tables are pretty much unusable on a day as hot as yesterday.